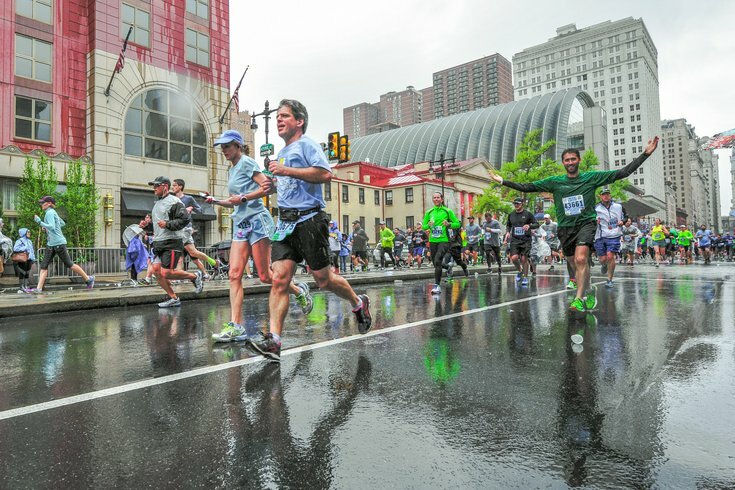 Runners pass the ACCT Philly table full of energy despite the rain during the Broad Street Run, Sunday, May 1, 2016. Whether you’re running in the Blue Cross Broad Street Run tomorrow, cheering on a coworker or just trying to avoid it on your way to get morning coffee, here is what you need to know. The 10-mile route begins at 8 a.m. on Sunday, May 6 along West Fisher Avenue and ends at the Philadelphia Navy Yard. You can preview the route here. The race started in 1980 and has drawn thousands of runners every year. The year it began, 2,454 men and only 122 women finished the race. As the race began to grow in popularity in the mid-2000s, the city had to cap entrants at 40,000 with a lottery system beginning in 2013. Now, roughly 35,000 people finish the race every year, and a majority of them are women. Heck yes. Runners: Want to warm up? You can do that about a mile north from the starting line at Central High School Athletic Field, located at Broad Street and Somerville Avenue. This closes at 7:40 a.m. so get in all of your stretching — and go to the bathroom there, too — before then. And for all of you bystanders: Here’s the port-a-potty map. OK, that should be all of the important stuff. Here’s a breakdown of parking, transit and other need-to-knows. For obvious reasons, but we’ll spell it out for you anyways, there is no parking on Broad Street on Sunday from Olney to the Navy Yard from 2 a.m. until 1 p.m. And Broad Street will be completely closed beginning at 4 a.m. from Olney to Windrim avenues. If you are driving in to the city from out of town, there is no parking at the starting line. Parks and Recreation advises you to park your car — for free — near the finish area at the Stadium Complex at Broad and Pattison and take the Broad Street Line to the start. After the race, shuttle buses will take runners from the finish line back to parking areas. Look for yellow school buses. Broad is expected to reopen as soon as the last runner goes by and the street sweepers clear the road. The entire course is projected to be cleared by 11:30 a.m. The race start area on Broad Street from Olney Avenue to Windrim Avenue will close to traffic at 4:00 a.m. and Broad Street from Windrim Avenue to Erie Avenue will close at 7:00 a.m. The remainder of the course along Broad Street will close to traffic at 7:45 a.m. The race may begin at 8 a.m. but traffic and transportation will be affected well before then. There are a number of detoured buses, the Broad Street Line is free before 9 a.m. and Regional Rail will run on a weekend schedule. Subway- Race participants can ride SEPTA free of charge prior to 9:00 a.m. Just flash your official race number to the SEPTA cashier. Twelve express BSL trains will be added to the service schedule prior to the race with stops at Olney Transportation Center and Fern Rock Transportation Center. Regional Rail- Regional rail trains will run on their weekend schedule. Each train is typically comprised of five to seven cars with an approximate capacity of 600 to 850 passengers. Early morning service will be offered on the Glenside Combined Line. Morning service from Glenside and Jenkintown will connect runners to the Broad Street Line at Fern Rock Transportation Center. In emergencies or to report a suspicious person, activity or item (a backpack, package, or container), notify a police officer immediately or call 9-1-1. Do not try to open, move, cover or touch a suspicious item. Sign up for free text alerts from the City to get weather, transit and public safety updates. Text RUNPHL (one word, no space) to 888-777. Drones, small unmanned aircraft, are not permitted to fly over the Broad Street Run. A full list of prohibited items is available on the event’s website.